Teamwork is a subject that receives so much attention. Almost every organisation wants more of it and is willing to invest in getting it – especially at the top where it is often in the shortest supply. But do we know what qualities to look for in someone who will make a good team member? 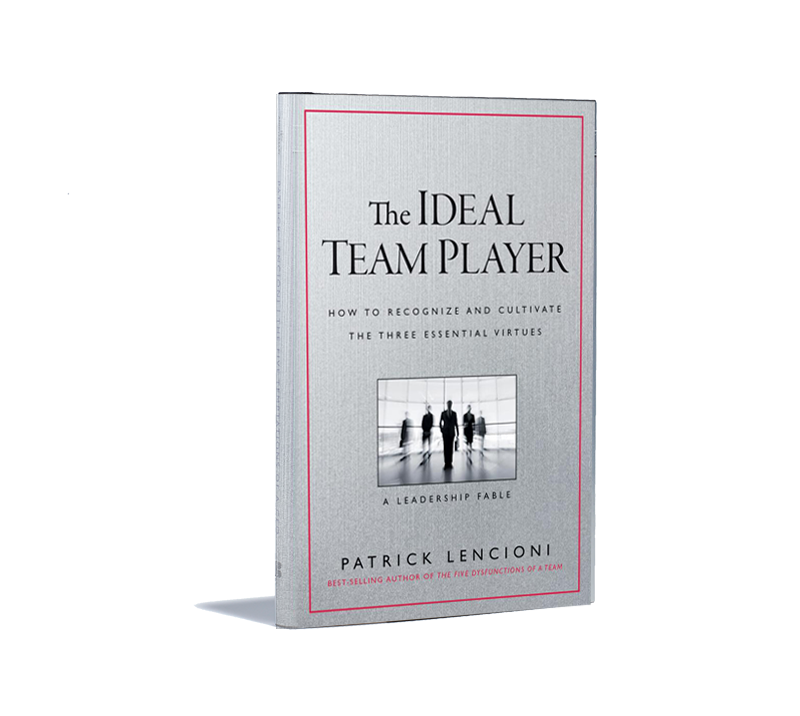 Well this month Patrick Lencioni released his latest book, The Ideal Team Player. It’s written in his usual style as a fable and it’s a wonderful read. In the book he describes the qualities of an ideal team player. I had a discussion with him about these qualities. Question: Patrick what is your latest book all about? This book is focused on individual team members rather than the dynamics of the team as a whole. I wrote it because while I’m confident that almost any group of people can become a team with the right amount of guidance and support, there are some individuals that greatly accelerate the process because they share three distinct attributes. Question: What are these attributes? The first and most important virtue of an ideal team player is humility. A humble employee is someone who is more concerned with the success of the team than with getting credit for his or her contributions. People who lack humility in a significant way, the ones who demand a disproportionate amount of attention, are dangerous for a team. The next virtue of an ideal team player is hunger – the desire to work hard and do whatever is necessary to help the team succeed. Hungry employees almost never have to be pushed by a manager to work harder because they are self-motivated and diligent. They volunteer to fill gaps, take on more responsibilities and are eagerly looking around corners for new ways to contribute to the team. The final virtue of a team player is not about being intelligent, but rather about being wise or smart in how to deal with people. Smart employees understand the nuances of team dynamics, and know how their words and actions impact others. Their good judgment and intuition help them deal with others in the most effective way. Question: What is the payoff for the team of these attributes? The impact of ensuring that members of a team value and demonstrate these attributes cannot be overstated. Most teams that struggle are not lacking in knowledge or competence as much as they are unable to access that knowledge and competence because of dysfunctional behaviours. Actually I’ve come to the conclusion that these three seemingly obvious qualities are to teamwork what speed, strength and coordination are to athletics—they make everything else easier. Question: Of the three do you think any is more important than the other? Yes, undoubtedly for teamwork the most important of these virtues is humility. The ultimate foundation of being a team player is a person being willing and able to put the team’s interests above his or her own. Only a truly humble person can do this effectively. Question: Finally Patrick how do managers cultivate these qualities in their teams? The most reliable way to ensure that teamwork takes hold is to hire only ideal team players. Of course, that is neither possible nor practical, especially considering that most leaders don’t have the luxury of creating their teams from scratch. But all leaders can certainly do their best to try to recruit, select and hire people who are humble, hungry and smart when an opportunity arises to bring on someone new. In my book I’ve outlined interview questions and assessment resources that can help managers and leaders mine for the qualities in potential job candidates. By interviewing thoroughly and checking references with an eye towards a candidate’s reputation and behaviour, a manager can hire people with a high degree of confidence that they’ll be good team players. This book is a must read for any organisation that’s serious about teamwork. All too often an organisation launches into the team building process without first thinking about this critical piece of the teamwork puzzle – the individuals and the qualities they possess. We still have a few copies of the book to give away. Please comment below – tell us what individual qualities are important to you in the members of your team and we’ll send a copy of the Ideal Team Player to selected contributors. We have had some excellent results in as far as team work is concerned which was accomplished through a structured intervention around 2 – 2.5 years ago and still holds. The aspects that are described resonates and are aligned to the important aspects that we focussed on. Humility is very important and through that ensuring that the team goals are superior to the individual’s. “Whatever it takes” is embedded in our language and I hear it being used very often. The third aspect that we focussed on is having a “responsible” rather than “victim” mindset. This has served us well and we are busy working with the wider organisation on this. Hi Danie – thanks for your comment. Moving from the victim mindset on a team to really throwing your hat in the ring and adding value is a huge shift. I am interested to learn from you how this is going with the wider organisation. I believe humility is the key to great teams, I really didn’t know of smart team members till today although I have always believed that listening skills also adds value to being a great team leader. I feel that to be a team player, you must be able to work with people and be able to reach out to them with good listening skills. Having their best interests at heart will help both the team and the organisation. Spending time with people to understand them goes a long way. A great deal of diplomacy also helps a great deal!. Thanks Manuja – you raise the issue of spending time with people. I think this is vital – its hard to build a team unless you’re willing to spend more time with each other. And not only task time but also time to show that you really care. I would love to read up more on this, but it is heartening to see the affirmation of humility as a core anchor for team players. I wonder if for too long, those with a more introverted approach have been almost sidelined when perhaps humility comes more naturally to them. It is of course a grand generalization. Perhaps the word hunger could encapsulate the concept of energy. I certainly wouldn’t want anyone in my team who had no spark in their battery – despite how effective their engines may be !!! Hi Steve – its great to get your post. Thanks! I think hunger does encapsulate the concept of energy. On a team its a hunger (energy) for results. It’s having an external focus on things … there are few teams that I can think of that exist purely for their own sake. The whole purpose of a team is to do something that can’t be done alone. And its being hungry to be a part of this. All this takes energy … a real spark in the battery! I often have seen hunger and wisdom in teams; the one that most eludes us, is humility. You can argue that humility comes with great wisdom and it can certainly be perceived that way. Though more and more I see less and less humility. The needs of the individual are greater than the success of the team. Recognition, praise, knowing that you individually add value, appears to supersede all else. Maybe it is a generation thing (I dislike saying that it makes me feel old!) or possibly that we encourage reward and foster this behaviour. Either way, encouraging a mix of qualities, behaviours and personalities in any team will foster diversity and a chance for each team member to experience and grow with others. Looking forward to reading this book! Hi Julie – your experience with humility is very interesting. Is it just a generational thing or do you think it is a values thing. I love the quote from CS Lewis on humility … humility is not about thinking less of yourself .. it is about thinking of yourself less”. I know you will enjoy the book. What powerful replies to such sensible questions. I woul like to read the book and will certainly acquire a copy. Working with business leaders as I do, the importance of an effective and committed team very frequently manifests itself. The key ingredients are all there in the answers to the questions. Perhaps another key ingredient is real leadership…someone who has the ability to identify the latent skills and bring them to the fore! HI Dale – I agree – the response to the questions has been so enlightening! I’m sure everybody has heard the African proverb that says, “If you want to go fast, go alone. If you want to go far, go together.” I believe in teamwork and humility in business. We are constantly looking for people with these qualities when we do new appointments. They are more important than qualifications and also more than experience at our interviews. It does however remain very difficult to identify and ensure that we do put “the right people on our bus”. Hi Willem – thanks for your comment and reference to the proverb. Its a beauty! I am interested to hear that you value these qualities more than qualifications and experience and that you have a way of looking out for these at interviews. I would love to learn more about how you do this. Thanks once again. In my opinion humility is a key behavior. A real team player will prioritize team success before their own personal success. Next is being emotionally intelligent, understanding team dynamics and drivers of individuals within a team. Most books around team speak from the leader or managers role. What I like about this is the responsibility is being placed on each team player. This gives you the greatest possibility to succeed as each one needs to take responsibility. The fact that Humility is the first virtue is fantastic as today this seems to be a forgotten virtue. I look forward to reading this book. Humility and hunger as mentioned are important and needed for building a good team with good team playing members. What is also important to me is to be truthful, do not hide a mistake, tell upfront if one made a mistake, not only for others to learn from it , but also to foster the drive for continuous improvement as well as to build on the humility concept. Basic discipline is not negotiable, if you promised something, or made a commitment, keep to that. It enhances the principle of having respect for people and their time, another build on humility.